A few days ago, a commenter asked about a good method for affixing DIY printed labels to jelly jars. Andy Biggs, mastermind behind the Beer and Jam Labelizers, mentioned he uses milk to glue labels to his bottles of homebrewed beer. What?!? After a bit of internet research, I learned this is a common method in the homebrew beer community. 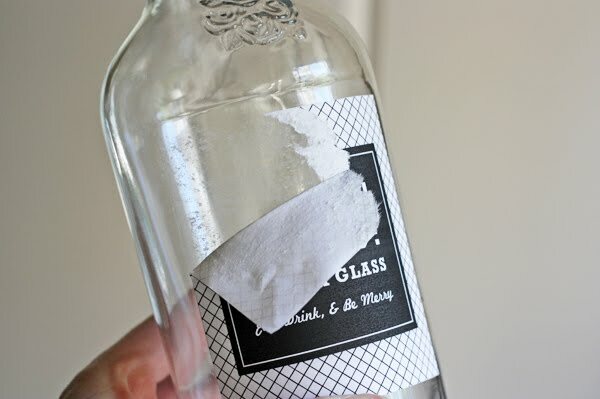 Labels need to stick on securely, but be removed easily so the bottles can be reused. A preliminary note: don't try this with inkjet-printed labels. The ink will bleed and run if it gets wet. Stick to (har har) laser-printed labels, either color or black and white. Use whole milk or 2% to wet the back of the label. Then just stick it to clean glass. When the milk has dried, the label is stuck on firmly. See? It tears when you try to pull it off. But when you run it under water and get the paper wet, it peels off easily with no residue left behind. 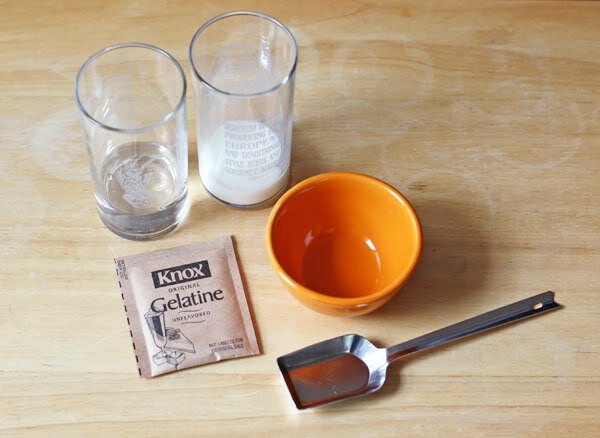 If you need glue that's even stronger, try a recipe using gelatin. I read about similar concoctions in several online forums, then tested and modified a recipe. Put the water in a small bowl and sprinkle the gelatin over it. Wait about 5 minutes. Then microwave the milk to nearly boiling and add it to the gelatin. Stir until the gelatin is completely dissolved. This recipe yields 1/4 cup of glue. The glue will look like this. Brush it onto the backs of labels while it's still warm and liquid. When it cools to room temperature, it becomes a solid gel. You can heat it for 15 seconds or so to liquify it again. Or you can eat it if you're hungry. As you might imagine, the milk will spoil eventually, so the wet glue mixture should only be stored a couple days. 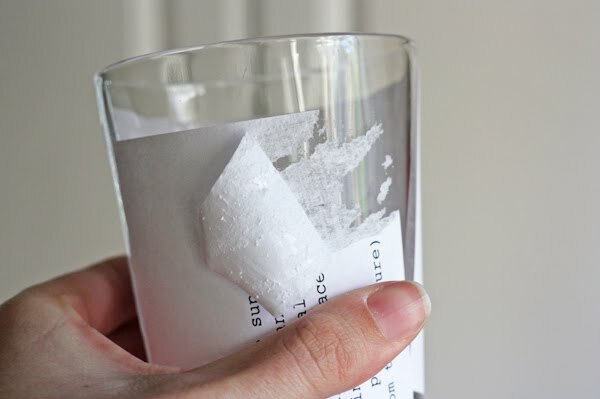 The milk-gelatin glue bonds paper to glass even more strongly than milk alone. It requires longer soaking in water and a little more rubbing to get the label off, but again, it comes off cleanly. No need for solvents to remove any sticky, gummy residue. These tricks would work well for sticking posters to windows or mirrors, too. How amazing and how simple! Must try that. Well, isn't that clever! And so are you in your poetic punnyness. Ha! Alex dumped his bowl of apple pie and ice cream on the couch last night. I think ice cream might be good glue, too. Definitely tips to keep in mind! I think you're amazing, making the time to suss all these things out for us and making everything you do as well! Oh, dear.... You didn't take the time to experiment, though, huh? Judging by the way my shoes stick to the kitchen floor after my kids make a milkplosion, this should really come as no surprise. But it still does. Good to know! Wow! It is really easy. Very clever post. I can make use of this. My pottery teacher claims that unglazed pottery which would normally be porous can be made non-porous by sealing it with milk. I think she says you just swish some milk around the inside of the pot and then pour it out. I've never quite believed her - but if you can use milk as glue then maybe it works. (My pottery lessons are all in French hence my uncertainty about the actual process). Wow! I love finding out things like this. Cheap, easy and natural. My favourite things! It totally makes sense. Whenever I find the napkin glued to the counter next to my kids' cereal bowl, I will remember that it's not a mess, it's a craft project. That's right—take a moment to marvel at the miracle that is Milk. It won't smell when the milk starts to go bad on your label? It shouldn't get stinky since the milk has dried. Like the dried flakes you find around the plastic cap of a milk jug, or like powdered milk. There's no moisture for bacteria to grow in and spoil the milk. This is great! I hate gluey labels that don't come off properly and end up in a mushy mess once you've scrubbed them off. You clarify the answer to the question of your commenter in a good way. I appreciate it. I'm going to try this for paper mache. I'd put it in a small crock pot or on a low temp heating element to keep it liquid but I bet it would work...and my hands won't get cold dipping the paper bits. 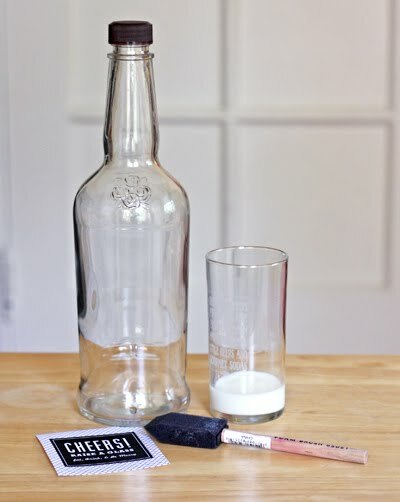 I am going to try this with mini bottles and our printed logo, thank you for the post! I only have an inkjet computer and print my labels with it. I used milk as a glue this year and the ink did not run at all, even when I completely submerged it. It may depend on what paper and/or type of ink you use. Interesting! My inkjet printing runs when wet, but good to know it might be possible for some! 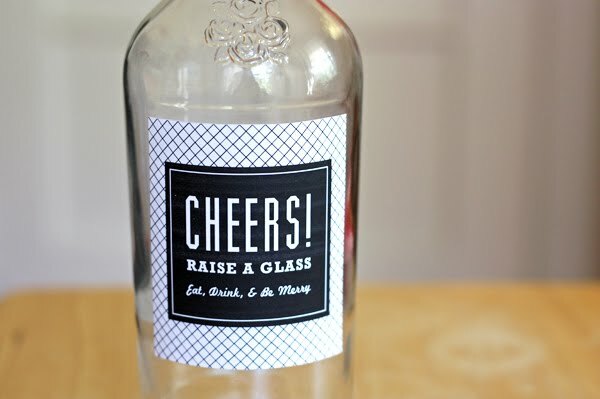 Wow this could be really helpful for bottle labels in Seattle, WA I always have the hardest time. Thanks for this. Thank you so much for the tip, I was looking for adhesive labels for my jars but could not find anything small and affordable enough. Now I can print my own and stick it on without adhesive chemicals! 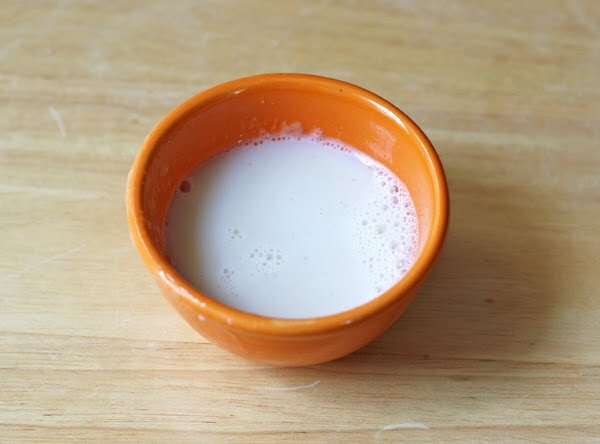 I just tried the milk method and it works perfectly! FedEx Office does laser printing and I used a very, very small amount to apply to the back if the paper so it would seep through. Took a few tried to get it right but this is a fantastic and cheap solution for labeling. Thank you! i am looking for a way to stick rice paper to a bathroom window for privacy- think this would work?? (i know i can go buy it, but i already have a ton of rice paper) TIA! Not sure since I haven't worked with rice paper before. If you have a ton, you could always test a chunk. Otherwise, repositionable/temporary spray adhesive? I bought some at Michael's for a different project. I definitely need to keep this in mind for later. It is such a neat trick to have handy. Thanks for the post! This is amazing - works perfectly, hello personalized labels on my jam! Super useful! Do you know if this will work on plastic bottles as well? I would guess yes, but haven't tried it. I tried it on a plastic bucket, and my label popped off after an hour or so. But it binds beautifully to glass. So I'm on the hunt for plastic-friendly alternatives! I'm sorry... but you are awesome. What a great tip, I was looking for an adhesive that would be easy to wash off of jam jars and this is much easier than I expected. I just mixed up some trim milk powder in a little water and it worked perfectly.